The organizing team just recieved an email from someone who pretends to know more about a commercial “Giana Sisters” remake, which is in the works by the german company “bhv Software GmbH”. If we can believe Amazon Germany the game should be out in shelves on 15th May 2008. We are really looking forward to have a talk with the guy who has details. Actually this is something which scares some of us off. The history of “Giana’s Return” has begun as Giana 32k (DOS), a Giana Sisters clone with 7 levels, coded in less than 32 kilobyte. Later on, he wanted to make a full game out of it and was looking for a leveldesigner, this is where Kojote, the current organizer of Giana’s Return came in. To shorten it a bit, Myth was working on a Windows version (Giant Worlds) which was published on a computer magazins cover CD. From this moment on he had the attention of the copyrightholder Armin Gessert, who tried to sue him, but after a chat on the phone, he dropped this. 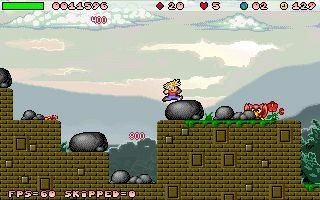 Myth was too scared to continue development, but Kojote had plenty of new levels left, which were now without use. Considering building a level and testing etc takes more than some would believe, he took the project into his hands, now as “Giana’s Return”. Due to Myth complaining about his poor code and not giving the relevant parts, we had to start from scratch. “Giana’s Return” was now born in 2001/2002. With the help of a console coder known as Christian Nowak, we have gone pretty far and were able to release a 0.90 beta version to the public, mainly for Dreamcast, GP32 and Windows (32-Bit). Due to unkown reasons, CHN dropped the work on Giana’s Return and left the console scene in general. There we were… an almost done game, but with some minor bugs which destroyed the gameplay – and the best part – no source code. 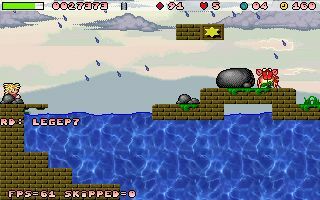 The whole game required a new team and a new code base. In 2004 we pulled our head in an iceblock and started over again, with a NEW team. Of course the organizer tried to get in touch with the responsible people, specially Armin Gessert. It turned out into a real pain, as Armin seems to hide himself pretty well. We have sent a written statement to him, CHN at the beginning of the project, as long as the project organizer. Without direct response from Armin. We didn’t take it too serious as we know he has to earn his bread as well, but we did not gave up. We even tried to ring up Armin Gessert at his company “Spellbound AG” in Germany – all we reached was talking to Mr. Speer, who said he will talk with Armin. No direct response from Armin again at all – up to now. Considering “no answer” is an answer too and the word of Mr. Speer (see E-Mail above), we accepted his silence as “Do what you want”. After all we had no money intensions and just bring a worthy sequel of Armin’s great game. We have also been in touch with Chris Hülsbeck, who allowed us to use his original .SID files (the e-mail is still in our hands) and Manfred Trenz allowed us to redo all of the levels one by one. Of course the last two don’t have too much to say, as the copyright holder is still Armin, but having support from two people who were involved as well, nothing could have gone wrong. Regardless to this, we want to point out again that no profit money has been made from this project, a four digit Euro sum has been invested by the organizer up to this day. Not to mention the hours and hours of work, provided by all team members. Depending on the conflict which turns up now (no one is interested in getting sued for something), we either change the name of the game (as already announced) or we will limit the release to platforms which are comercially dead such as the Dreamcast and GP32. The situation is more than disappointing, specialy after the progress we made recently and still do. Well… let’s find out how limited the license of “bhv Software GmbH” is, maybe they just have the rights for a Windows version – and the Giana’s Return Team can easily avoid a Windows release, to keep everyone happy.